Stap uit je cruiseschip en een riviervlot op deze 3,5 uur durende excursie langs de Mendenhall-gletsjer. Een ervaren gids bestuurt uw vlot, zodat u kunt genieten van het prachtige berglandschap terwijl u zes mijl rond de voet van de gletsjer zweeft. Wind door streken van de stroomversnellingen van klasse II en III en wikkel het uitje af met een heerlijke snack langs de rivier. Gezinnen, beginners en meer geoefende mensen zullen genieten van deze vlottertocht op Mendenhall Glacier. Havenvervoer vanaf Juneau inbegrepen. Beautiful Tour! Alex, our guide, was very professional, knew the river very well, and obviously enjoyed his job! We were pleased to find it was not a true whitewater rafting type tour with heavy rapids. It was more of a float tour. All water gear was provided. Shoes and items were collected prior to departing on the tour and ready for us at the end of the tour. The experience was worry-free. Our guide was fantastic. It was fun for the entire family! I would do it again. The staff was knowledgeable and courteous. The raft ride across the lake and down the river was very interesting and fun. the guide was a student from Minnesota and really enjoyed his job. The post rafting snacks are pretty lame. It rained during most of our ride which made it pretty cold. We didn't know there were only 4 rafts where everyone paddles. I'd recommend you include a note to the vendor if that is what you desire. Our raft as most had a guide controlling his set of oars, and the passengers were along for the ride. Still a very enjoyable trip down a glacial river - great views of Mendenhall Glacier, there was a bald eagle sitting on a branch about 15 feet away from our raft at one point. You may be disappointed if your expecting a full on whitewater rafting experience, but it is a very beautiful, interesting, and enjoyable way to see part of Juneau. Well coordinated with bus shuttle from port to river and return. Bus driver gave narration along the trip, both directions. Many eagle and salmon sightings! Fun rafting and beautiful scenery. Our guide was very skilled at guiding us through the class 3 rapids. This was a good tour. Our guide worked hard to ensure we had a good trip. We got to see two black bear cubs playing on the river bank. 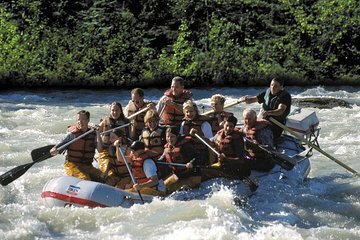 Rafting experience was great- we had the raft where you had to paddle with the guide and I would recommend it. Was a rainy day but ride was beautiful and fun and our guide was very knowledgable. Incredible experience for the entire family!